The Copay Savings Card is also available at the doctor’s office. Your patients can save on their ZTLIDO prescription and refills with the Copay Savings Card. 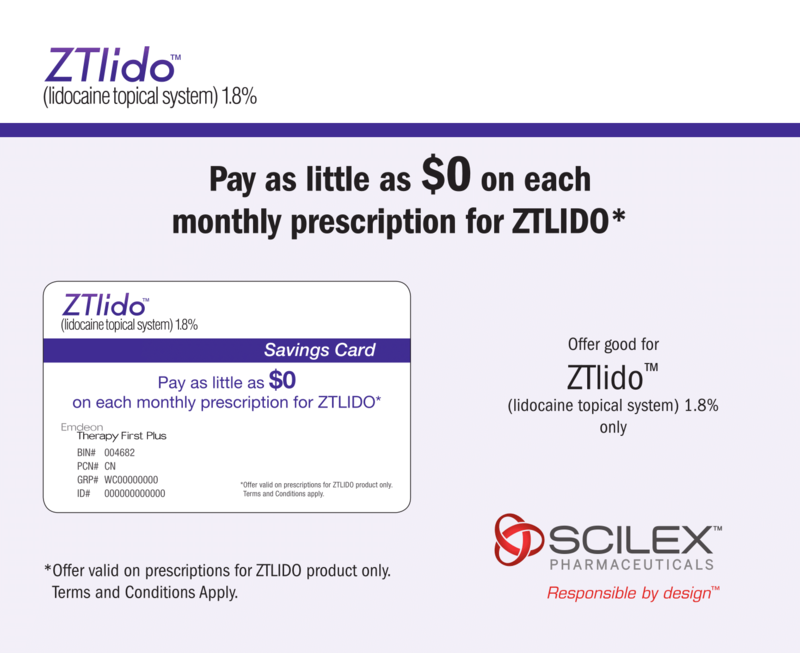 *Offer valid on prescriptions for ZTLIDO product only. Restrictions apply. Not valid for patients eligible for benefits under Medicaid (including Medicaid managed care), Medicare, TRICARE, Veterans Affairs, FEHBP, or similar state or federal programs. Offer good only in the USA and Puerto Rico. Request samples to get appropriate patients started on ZTLIDO. Reference: 1. ZTLIDO (lidocaine topical system) 1.8% [Prescribing Information]. SCILEX Pharmaceuticals Inc. 2018.